The battery is definitely the most challenging part of any smartphone. Every day we have faster devices, with larger screens and better resolutions; and every day is more difficult to spend the whole day without fully drain the battery of our phone. If we don’t have too much battery, nor the possibility to charge the device during more hours, it is advisable to take certain steps to avoid unnecessary energy consumption. There are certain parameters that we can adjust to improve its performance and make the battery last until we get home and can charge it again. Before rushing to configure anything, it is advisable to take a look at our battery consumption. Android has an option for this, which we will find in the section “Battery” of the “Settings” menu (on some versions of Android it may be found in the submenu “About Phone”). 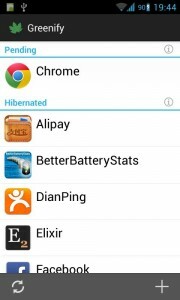 Here you will find a list of the applications that are currently consuming battery, and in case you find some that you don’t need or should not be running at that moment, you can turn them off or set the app to not consume so much. In the previous list, we see that most of the consumption goes to the screen. If you adjust the conditions of brightness and illumination, and set it to turn off after a few seconds of inactivity, you can extend your battery life considerably. Finally, there are some apps that can help us optimize energy consumption. 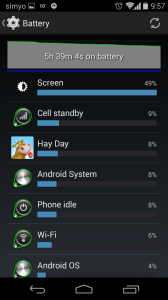 One of the best is Greenify, which puts the apps that we don’t need at that moment, so they don’t consume battery. We can download Greenify free from the Play Store, and since a few months ago, we don’t need to be root in order to run it (though if we are root, we have extra functionality root ) .